Boutique Rose Gardens has many distinctive features, the most distinctive ones being their extreme comfort, stylish interior and lush garden of flowers in the inner courtyard. The complex has nice location, being placed at second line from the beach in the beautiful resort of Pomorie, on the peninsula that separates the salt lake from the sea bay. The architecture of the complex is clean and modern, with French windows and romantic balconies which reveal unique panoramic views towards the sea and the garden. During the construction have been used the most advanced technologies and natural materials such as wood, granite, marble and wrought iron, and many ornaments. In addition are provided all necessary amenities to satisfy the most discriminating taste. The garden in the inner yard provides a true explosion of colors, as it establishes a sense of serenity and warm relaxing atmosphere. Here one can find different varieties of Bulgarian roses and a wide selection of rare plants specifically chosen to provide a garden of blooming flowers. The garden further comes with waterfalls and ponds and features a few romantic gazebos and recreation areas. 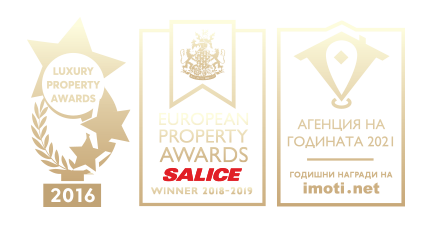 Boutique Rose Gardens is an ambitious project by the same team of investors behind the five-star Grand Hotel Pomorie, winner of the highest award for architecture: "Building of the Year 2007" and the most prestigious Hotel Award - "The Best Hotel on the Balkan Peninsula 2010". Boutique Rose Gardens is a gated holiday complex of the four star category. It consists of eight five-story sections. All the entrances enjoy lavish decoration and a separate elevator. The yard is 2000 sq.m. vast and features a beautiful garden with lots of greenery and flowers, fountains, walkways and recreation areas. The total area is 6508 sq.m. and the unfolded built up area is 23 000 sq.m. The number of apartments here is 257, the choice is between stylish studios and spacious penthouses, apartments with one or two bedrooms. The views are towards the sea, the city and the lake. Provided are 46 underground parking spaces and parking for 50 cars adjacent to the complex. Boutique Rose Gardens complex was completed in August 2011 and has permission for usage since 28.08.2011. All apartments at the Boutique Rose Gardens complex are offered for sale with bonus of a built-in kitchen. Any apartment in complex Boutique Rose Gardens can be booked with a non-refundable deposit of 3000 Euro, payable by credit card or by bank transfer. Upon payment of the deposit, the apartment will be reserved for the period up to the signing of the preliminary contract - within 28 days. • 50% within 6 months after the preliminary contract, upon transferring of the ownership. • 100% within 1 month after the preliminary contract, upon transferring of the ownership. • Construction company with an impeccable reputation that constructed the five-star Grand Hotel Pomorie, winner of the highest award in architecture in the country: "Building of the Year 2007" and the most prestigious Hotel award - "Best Hotel on the Balkan Peninsula 2010". Some of the available apartments in the complex come with discounted prices until the end of October 2013. Please, check them at the column Promo on the Prices & Availability list. Deferred payment until the end of 2014: with no interest rate. Deferred payment for year 2015: with 8% interest rate on the remaining sum. • Support and assistance to the owners in order to ensure peace and undisturbed use of their homes and the complex as a whole. The apartments in Boutique Rose Gardens complex are offered for sale unfurnished with the option of fully furnishing at an additional fee. Suitable option for furniture is provided by the investor. There are also apartments with furniture. This is indicated in their description. Each one of the apartments in "Boutique Rose Gardens" complex is offered for sale with a bonus free kitchen. • 5 chamber window joinery SHUKO, color "Golden Oak"
• Installations for telephone, cable TV, internet, security. The architecture of Boutique Rose Gardens complex is clean and modern, with French windows and cozy balconies which reveal unique panoramic views towards the sea and the garden. During the construction have been used the most advanced technologies, as well as natural materials such as wood, granite tiles, marble and wrought iron, as well as many decorative elements. In the complex are provided all necessary amenities to satisfy the most discriminating taste. Boutique Rose Gardens complex is an ambitious project by the investors behind the five-star Grand Hotel Pomorie, winner of the highest award in architecture in the country: "Building of the Year 2007" (architect Stanislav Nikolov) and the most prestigious Hotel award "Best Hotel on the Balkan Peninsula 2010". Among the other complexes of the same team are complex "Piri" and business center "Largo Center". The town of Pomorie is famous for its ancient history and its spa center, as well as its lake which is rich in healing mud. The region treats diseases of the musculoskeletal system and the nervous system, as well as gynecological and skin diseases. Pomorie enjoys beautiful beaches, where the sand is saturated with iron. The area is extremely suitable for a variety of water sports, spa treatments and visits to various cultural and historical sites. The apartments in Boutique Rose Gardens complex will be rented on a hotel basis by the letting company of the investor. The services include finding a tenant, change of the linen and towels, cleaning, monitoring the condition of the apartment. Owners should pay 20% of the annual profit for the letting of their apartment.